Texworld USA and Apparel Sourcing USA will bring the best in fabrics and apparel resources to the Javits Center in January. 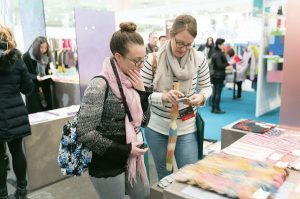 Atlanta-based Messe Frankfurt Inc.’s Texworld USA and Apparel Sourcing USA events will return to the Javits Center in New York City January 21-23, 2019, for the Winter editions. Texworld USA — an apparel sourcing event for buyers, research and product development specialists, designers, merchandisers and overseas sourcing professionals — offers attendees “the opportunity to meet directly with a wide range of manufacturers from Asia, the Middle East, North America and from many other regions from around the globe.” The show is produced in partnership with Austria-based Lenzing. Items on display at the show are organized into 16 categories including cotton; denim; embroidery/lace; faux fur; findings, trims and accessories; functional fabrics; jacquards; knits; linens; novelties; prints; shirting; silk; silky aspects; wool; and yarns. Apparel Sourcing USA — a long-term joint venture partnership between Messe Frankfurt and the China-based Sub-Council of Textile Industry, China Council for the Promotion of International Trade (CCPIT-TEX) — is designed to offer apparel brands, retailers, wholesalers and independent design firms a dedicated sourcing marketplace for finding the best domestic and international apparel manufacturers. According to Messe Frankfurt, Apparel Sourcing is the only event on the East Coast to focus on sourcing finished apparel, contract manufacturing and private label development. For Winter 2019, organizers will group products into the following 21 categories: activewear, polo shirts/shirting, knits/tops, sweaters, dresses, suiting, ties/ascot, denim, pants/bottoms, loungewear/ sleepwear, intimates/shapewear, socks/hosiery, gloves, outerwear/coats, hats/headwear, swimwear/resortwear, uniforms/workwear, jewelry, shawls/ scarves and labels. The January 2018 edition of Texworld USA attracted 260 exhibitors and more than 3,700 attendees from 50 countries; while Apparel Sourcing USA saw 100 exhibitors and 600 attendees from 25 countries in January 2018. Visitors to both events will have the opportunity to view trends for Spring/Summer 2019-20 created by Texworld USA Art Directors Louis Gerin and Gregory Lamaud. Textile Talks on the show floor covering hot topics including fabric innovation, sustainable processes and trade; and the Explore the Floor series where visitors have the opportunity to participate in guided tours with industry experts. Registration is complimentary for qualified trade industry professionals. Messe Frankfurt recommends that attendees preregister online, but it also is possible to register on-site using a business card and photo identification. The show is open January 21 and 22 from 10 a.m. to 6 p.m., and from 10 a.m. to 4 p.m. on January 23. For more information about Texworld USA and Apparel Sourcing USA, please visit texworldusa.com and apparel sourcingshow.com.